What is a South Carolina Eviction Notice? South Carolina Eviction Notice: What Is It? A South Carolina eviction notice is a document used by a landlord or property manager to inform the tenant that they’ve violated the lease. The tenant must either comply with the lease or leave the property within the number of days stated in the eviction notice. Better known as a notice to quit, all South Carolina eviction notices must comply with the state’s landlord-tenant laws. An eviction notice must be served and the tenant must fail to comply with the notice before the landlord or property manager may file an ejectment lawsuit. What Are the Components of a South Carolina Eviction Notice? The proper name for the eviction notice. This includes how many days the tenant has to comply or leave the property and the type of eviction notice. The amount of time that the tenant is prescribed by state law and depends on the type of notice being issued. You’ll learn more about the laws soon and we’ll give you links to help you find them. The date that the eviction notice is created. The name of the tenant or tenants who signed the lease. This person or the individuals who signed are legally responsible for complying with the stated terms in the lease or rental agreement. The full address of the rental property. This includes the street address, any applicable lot or unit number, city or town, and the name of the county where the property is located. Include the date that the lease was signed and the type of lease that was signed (such as an annual lease or a month-to-month lease). Explain why the notice was issued. Give the number of days the tenant has to comply or vacate the property. 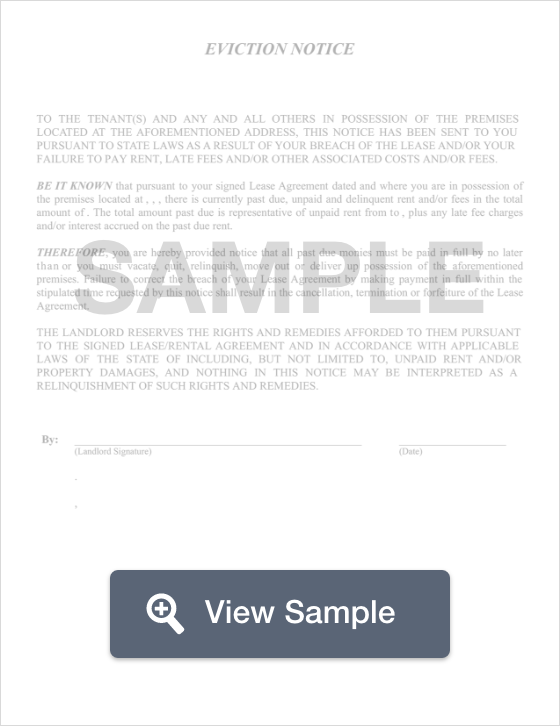 Include the printed name and contact information (including phone number) for the landlord or their authorized agent. You should also create a Certificate of Service to document the legal service process. The tenant must be legally served. In South Carolina, this means that the tenant may be served by the landlord or a private process server or via certified mail with a return receipt requested. The Certificate of Service and the return receipt play an important role because they show the court that the landlord followed the law in the way that they served the tenant. A Certificate of Service should include the date of service, the name of the person that was served, how service took place, and it should have the signature of the person who served the eviction notice. A 5-day notice for non-payment of rent a South Carolina eviction notice used to inform the tenant that they did not pay their rent. The tenant is given five days to pay or leave the property. The notice should list the full amount of rent due and the date by which it must be paid. Landlords may also find it helpful to list acceptable forms of payment and where the rent may be paid. This notice is governed by § 27-40-710(b). A 14-day notice for non-compliance is used to inform the tenant that they violated the lease in some way and that they have 14 days to correct the violation or leave the property. The notice should clearly explain the violation and give the date by which the tenant should leave if they choose to not comply. This notice is governed by § 27-40-710(a). A 30-day notice to terminate a month-to-month tenancy isn’t an eviction notice in the true sense. The tenant doesn’t have to do anything wrong for the landlord to decide that they want to end the month-to-month tenancy. In fact, the tenant can also use this notice to tell the landlord that they do not plan to renew the month-to-month agreement. This notice should give the date by which the property should be vacant and returned to the custody of the landlord. This notice is governed by § 27-40-770(b). What Are the Legal Considerations of a South Carolina Eviction Notice? Before a landlord may file an ejectment lawsuit against a tenant for non-payment of rent or for violating the lease in another way, they must serve the tenant with an eviction notice. Then, the tenant must refuse to comply with the notice. Until the landlord is able to secure a court order for ejectment, they may not replace the locks, disconnect the utilities, or have the tenant’s belongings removed from the property. Doing so without a court order is illegal. Landlords may not evict a tenant who reports code violations or uninhabitable conditions present on the property. That is known as retaliatory eviction. Landlords have a legal obligation to keep the property in good repair, up to code, and habitable. Additionally, landlords must comply with both state and federal laws when it comes to housing. They may not evict a tenant because of the tenant’s country of origin, skin color, race, gender, family status, disability, or religion. Illegal evictions can give the tenant a legal right to file a lawsuit against the landlord. The court may order the landlord to pay the tenant for what happened. The landlord may also be fined for breaking state and / or federal law. If you’re renting in South Carolina, you have both rights and obligations. You cannot be evicted because you report the property or the landlord to the housing authorities because of code violations or because the property is uninhabitable. You also may not be evicted because of your skin color, country of origin, race, gender, religion, disability, or family status. A landlord may not change the locks, disconnect the utilities, or toss your belongings out unless they have a court order. Before the landlord may file an ejectment lawsuit against you, they must first legally serve you with an eviction notice. When you receive the eviction notice, you should read it carefully. It will tell you why the landlord has issued the notice, what you need to do, and when you need to take action by. The notice should also give you contact information for the landlord, including a phone number. You can call the landlord if you have any questions about the eviction notice. If you think that you’re a victim of an illegal eviction, you should contact a landlord-tenant lawyer. They can let you know whether you have a legal claim that you can file against the landlord. You could be entitled to financial compensation. Another option is to reach out to the University of South Carolina Law Center and ask if they have a legal clinic. Legal clinics may provide affordable legal help to community members. You can also contact legal aid. If you qualify, legal aid may provide you with a lawyer. They also have various resources that tenants can use to help themselves. South Carolina landlords have a lot of responsibilities under both state and federal law. It’s important that landlords adhere to landlord-tenant law in South Carolina and avoid illegal evictions. Landlords cannot just file an ejectment lawsuit against the tenant. First, the tenant must be served with an eviction notice. Next, the tenant must refuse to comply with the notice. If those two key elements don’t occur, the landlord cannot file a lawsuit against the tenant. Landlords may not remove the property of the tenant, change the locks, or shut off the utilities unless they first get a court order. It’s illegal without the court order. It’s also illegal for landlords to evict tenants based on any of the seven protected classes listed in The Fair Housing Act (which are listed under Legal Considerations above). They also may not evict tenants who report the property for code violations or uninhabitable conditions. Landlords who practice illegal eviction methods of any kind may be sued by the tenant. The court could order the landlord to pay the tenant and they may also be fined for breaking state and / or federal law. If you’re a South Carolina landlord and you want to learn more about your rights and obligations, make sure that you schedule an appointment with a landlord-tenant lawyer who practices in the county where your rental property is located.